Asthma is a common long-term (chronic) lung disease and it affects people of all ages. When an asthma attack occurs, one's airways in the lungs get inflamed and narrowed, causing severe difficulties in breathing and can often results in deaths. AsthmaSymptoms.org is an information portal dedicated to help individuals to know more about asthma and its symptoms. Asthma often starts during early childhood. Therefore it is extremely important for parents to identify the symptoms as early as possible to prevent possible damages as asthma can cause severe damages to the lungs and brain as a result of insufficient air flow. Complete the questionnaire below to find out if you are at risk. Check all the boxes applicable to you. When I walk or do simple chores, I have trouble breathing or I cough. When I perform heavier work, such as walking up hills and stairs or doing chores that involve lifting, I have trouble breathing or I cough. Sometimes I avoid exercising or taking part in sports like jogging, swimming, tennis or aerobics because I have trouble breathing or I cough. I have been unable to sleep through the night without coughing attacks or shortness of breath. Sometimes I can't catch a good, deep breath. Sometimes I make wheezing sounds in my chest. Sometimes my chest feels tight. Sometimes I cough a lot, without other flu symptoms. Dust, pollen or pets make my breathing more difficult. My eyes get itchy, teary, puffy or burn often. I have problems with an itchy, runny or stuffy nose. Cold weather makes my breathing more difficult. My breathing problem gets worse when I'm around tobacco smoke, fumes or strong odors. When I catch a cold, it often goes into my chest. I had one or more emergency visits to a doctor in the last year because of breathing problems. I had one or more overnight hospitalizations due to breathing problems in the last year. 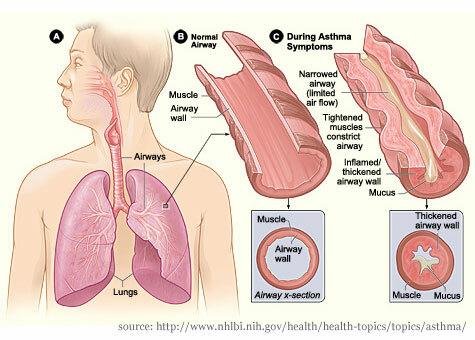 The illustration above shows how the airways are "inflamed" during an asthma attack. Currently there are over 18.4 million adults and 6.2 million children with asthma in the United States. However, only 6.3% of the people have visited their physicians regarding asthma. Of all the 24.6 million people with asthma, over 2 million of them have visited the hospital with medical emergencies due to asthma, which is approximately 8.13%. This means, people are not treating their asthma symptoms with their family doctors until emergencies occur. Over 3,600 people die as a result of asthma attack every year and the number is increasing. Asthma is a long-term disease that requires on-going attention and care. Individual with asthma problems need to be aware of the different symptoms caused by asthma attacks in order to come up with action plans to prevent asthma attacks from happening and combat asthma attacks during critical times. Keep track of your asthma attacks and symptoms can help you in preventative actions. For example, you should always avoid things that make your asthma worse such as eating the wrong food and doing the wrong exercises and activities. Medication can help you combat asthma, but it is always better to prevent the attacks from happening in the first place. The level of severity of your symptoms determines the type of medication and preventative actions you need to take. If you don't understand your symptoms, how else are you going to fight asthma when the attacks begin? If the medication you have cannot overcome the symptoms you are experiencing during an attack, you are putting your life at risk.